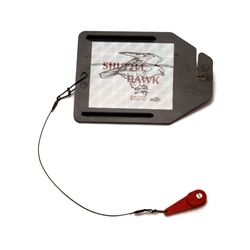 The Shuttle Hawk is a downrigger release carrier. Attached to your downrigger cable the diver will take your release, line and lure to a desired depth until released, then returns to the surface to be sent down again. Therefore, making it unnecessary to raise or lower your downrigger weight. Chris recommended these to me a while back, i finally was able to pick a few up since he was always selling out of them. After using them, it is no wonder why he can't keep them on the shelf. They actually work better than I expected, they are on every downrigger on my boat.